Welcome to our Roman Numerals Worksheet page. We have a range of worksheets to help you to learn how to read and write Roman numerals. For more information about Roman numerals and some worked examples, try our Roman Numerals List page. 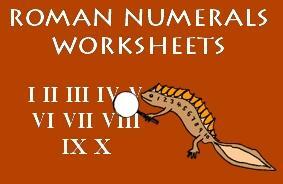 Our worksheets about Roman numbers cater for a range of abilities. There are two versions of each sheet: a Sheet A and a Sheet B. Sheet A generally has extra support and help, but has the same questions as Sheet B which has less support. The first set of sheets involves matching Roman numerals to their values by drawing lines. The second set of sheets involves converting Roman numerals to numbers and also from numbers to Roman numerals. Which sheet do I need? These sheets involve drawing lines to match the Roman numerals with their values. These Roman numerals worksheets involve converting from Roman numerals to numbers, and from numbers to Roman numerals. These Roman numerals worksheets involve adding and subtracting Roman numerals up to a given number. 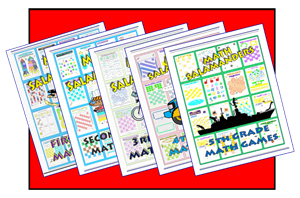 Some of the sheets are addition only, some involve both addition and subtraction. Adding and subtracting Roman numerals can be quite tricky - they would make a great extension activity for more able learners. If you already know how roman numerals work and fancy a challenge, why not try our Roman Numeral Riddles. Each riddle has 3 to 4 clues and a set of eight possibilities. When you have followed all the clues and crossed out the wrong answers, you should just have the answer to the riddle left. We have a range of riddles for all abilities! As well as Roman numerals worksheets, we also have a translator which can convert any number up to 10,000 into Roman numerals, or any number in Roman numerals into numbers. Take a look at some more of our resources similar to our Roman numerals lists on this page. If you want to play a simple interactive Roman numerals game, then take a look below at the game by abcya.com. You can always use our Roman numerals lists to help you! The game will open in a new browser window. Can't find the Roman Numerals List you are looking for? If you have looked at this page and the list you need is not here, please tell us in the Comments section below.